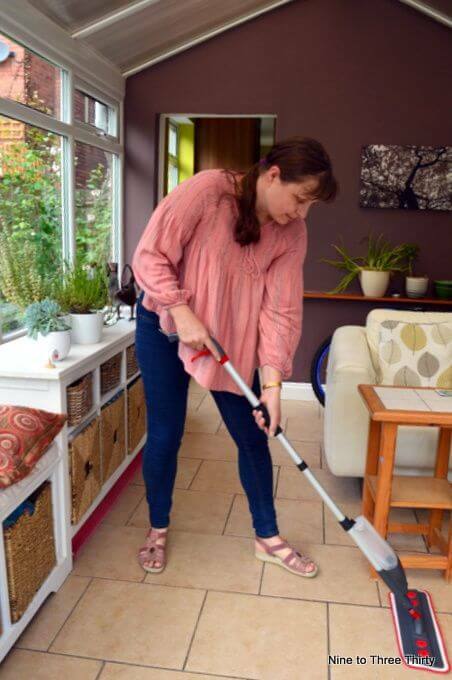 I’m not a big fan of housework, so I’m always looking for ways of making the job a bit easier. One thing I’ve tried a few of over the years is mops. This time I was asked to try out a spray mop to see what I thought of its performance. This floor mop is a bit different to the average and has some features that make it stand out from the other mops available on the market. 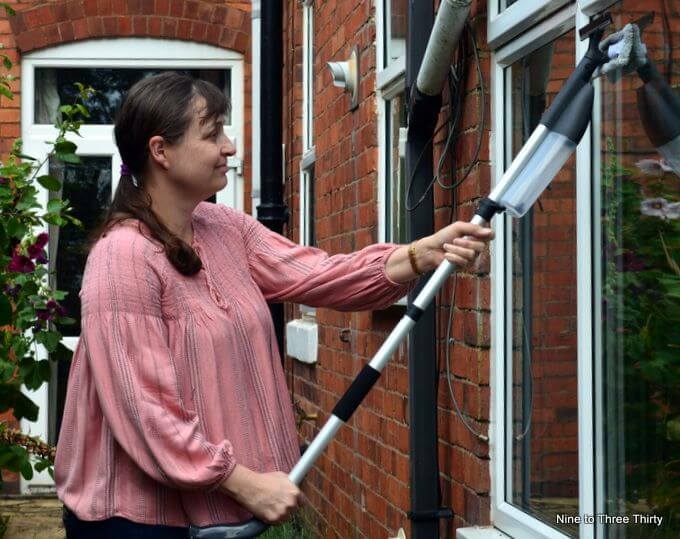 Firstly it’s a 2 in 1 mop because you get both a spray mop and a window cleaner attachment in your kit. This was a bit of a godsend for me as a few months ago I gave our window cleaners the sack and now I’m responsible for cleaning my own windows outside again. It is a bit of a chore as the conservatory has a lot of windows so there is plenty of cleaning to be done. I liked the fact that you fill the mop up before you start cleaning and the reservoir provides the liquid, so you don’t need to carry buckets of water around. It’s a 600ml bottle so it holds a reasonable amount and it can be easily removed from the holder to fill with the floor cleaner or window cleaner of your choice. The window attachment also includes a squeegee to help you get a good finish. You squirt the cleaner onto the window, which is useful for ones a bit higher up. The microfibre pad that the spray mop comes with seems well made and I’m confident it will last more than the 100 washes that it claims. In fact, it comes with two which helps make cleaning easier. Because the cleaning fluid is contained in the floor cleaner mop, it makes it easy to clean small areas of floor without having to fill a bucket. I found it useful for little rooms like the downstairs loo. It’s good for wooden floors and laminate floors too because you can add your wooden floor cleaner and just use it as a wooden floor mop or laminate floor cleaner. I have a Coupon Code 15OFFWIZ (Applicable on Amazon) for those wanted to buy a spray mop. It gives a 15% discount. I like the fact that you can fill it with your own cleaner. So many of these cleaning systems come with their own (often expensive) cleaning products. Interesting review. I can see myself using something like this – will pop over to Amazon and check it out. This sounds really helpful. I’m still trying to work out how to clean our outside windows – we’re on the first floor and the ground floor is a parking garage so it’s a bit tricky finding a way to reach! This seems like a pretty good product. I never got the chance to use it, but I remember that they used one in our old office. The one difference I noticed was that the floor was way slippery when they used a regular mop in comparison with this one. Thanks for the review – I’ve been wondering if these are as good as they are claimed to be!